Detail of one of the Dioscuri twins battling a Gigante in a painting depicting the Gigantomachia (War of the Giants). 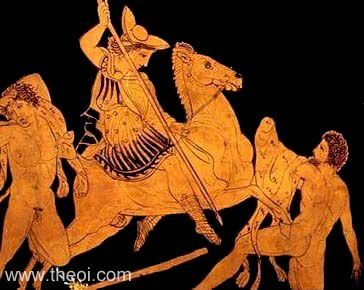 The demigod is depicted as a horseman wearing a petasos cap and armed with a spear. The giants are draped in leopard-skin capes. The other Dioscuri also appears in the painting (see other image).